Raelynn the Gravefinder is a Breton necromancer who has taken to practicing her black art in Moss Rock Cavern near Roxey Inn. The effects of her practices are driving customers away from the inn, leading the innkeeper, Malene, to ask for your help during the related quest. Once the related quest has been started, she can be found in the locked room in Moss Rock Cavern, along with one of her friends. Neither she nor the necromancer eat or sleep. Because of her high aggression, she will almost always be hostile and will attack you on sight. She wears a monk robe along with a pair of braided leather sandals. 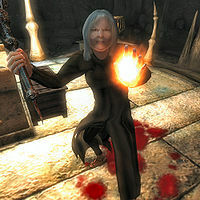 In combat, she relies on a leveled mace and a leveled set of standard necromancer spells. Also, starting from level 5, she has a good chance (75%) of carrying a leveled staff. Down at the Roxey Inn, Malene will tell you the full story on how Raelynn's necromancer exploits have influenced the environment - and her business as well: "A few months ago, that witch of a Necromancer decided to inhabit Moss Rock Cavern just north of my inn. I don't know what she does in there; frankly, I don't want to know. However, I do know that after she arrived, the woods at night became unsafe. I've seen undead of all types walking in the dark woods near the cave entrance. Now, this area's getting a bad reputation and my business has waned. Every day, it seems the number of undead increase. If someone can get into the cave and kill Raelynn, maybe we can stem the tide." Once Raelynn is dead she will be pleased: "I realize it's in poor taste to celebrate anyone's demise, but Raelynn was evil through-and-through. You've done the right thing." This page was last modified on 25 March 2018, at 03:09.